Also, if on a webpage that ublock is monitoring / filtering, ublock appears active (in that there's a filter count in brackets - admittedly only "1" on https://m.facebook.com, which is suspicious in itself, since I get a significant count doing this operation on a desktop pc) but clicking on the ublock entry in the menu doesn't open up the ublock UI at all. It just closes the browser menu. I hope I've not missed out any crucial information. If I have, please just post and I'll adjust as necessary. Report to Firefox devs please: https://bugzilla.mozilla.org/. By the way, can't you access the dashboard from the popup panel, itself accessible from the "uBlock Origin" browser menu entry? could you explain or send a screenshot? IF I understand you, you're saying get to the UI from the menu entry? If so, I referred to this in my initial post - selecting it does not produce the UI. It just closes the menu. I wasn't planning to publish uBO/webext before FF56, but because of the uBO/webext-hybrid debacle, I had no choice. Anyways, I can't see the options in Firefox for Android 55.0.2. However I can access the popup panel using the menu entry. However, eventually this stops working, I don't know why. The dashboard URL is a moz-extension://[random id]/dashboard.html. Other options: install Firefox 56 or Firefox 57 (that's what I use), all works just fine as far as I can tell. Actually disregard that part, it makes no sense. There would be no difference with webext-hybrid, it was essentially full webext as well, except for the small data migration part. Thank you everyone for your contributions. Really appreciate it. EDIT - just rewrote next 2 paragraphs for improved clarity. Gorhill's advice - #2958 (comment) - about quitting and restarting FF android seems to allow uBO menu entry to work again i.e. you can get to uBO UI (and therefore options 'cog'). I closed FF android successfully by swiping app away from recents list. Force stop I'd imagine would achieve same result. 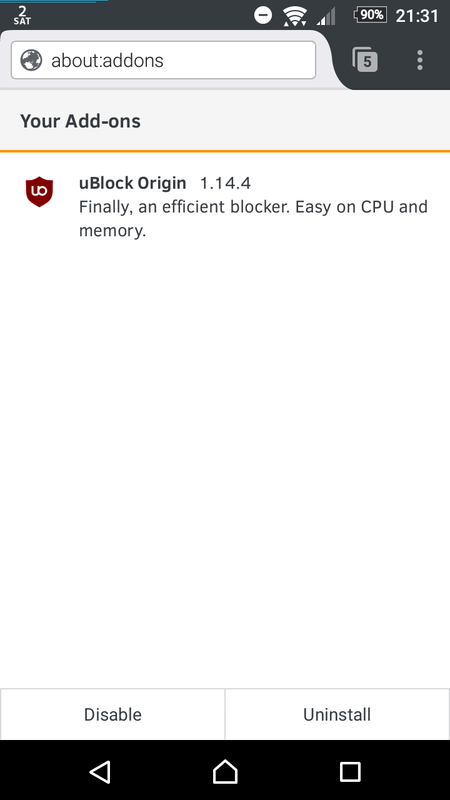 there does appear to be an issue in FF android 55.0.2 and ublock origin 1.14.4, where you can't access options from the tools / addons. The dashboard and logger buttons are not visible. there is initially an issue too with accessing uBO from the FF android menu. Closing app and restarting should restore menu entry functionality. One can then access options from uBO UI. FWIW, the workaround doesn't work for me. Is there any way (with a non-rooted device) to find out the random id? E.g. some about:... page that will list all the addons' IDs? Could you confirm you've followed the workround exactly? Did you try force-closing firefox android? Or perhaps power off then restart your handset (just grasping at straws here)? Then just start firefox, go into the menu, click on ublock at the bottom of the menu. You should then get the uBO UI page. My phone isn't rooted btw. Can you confirm what version of android, firefox and ublock you're running? It might be worth checking you're using the most current version of uBO. I'm seeing this on both a Nexus 6P and Pixel C, both running Oreo, using uBO 1.14.8 from AMO and Firefox 55.0.2 from the play store. I had tried the swipe-away (or click the X on the tablet) to close firefox, but I just tried the force stop as well, didn't change anything. Trying rebooting on the tablet ... that didn't help either. I rebooted, unlocked the screen, launched Firefox, tapped the menu, and then the "uBlock Origin" entry at the bottom ... and nothing happened. Maybe of interest is that this is a fresh install of uBO. I just noticed that the version on AMO is one release behind the latest non-beta release here, but the release notes for it don't sound like they would affect this, and Firefox for Android won't let me install an unverified addon. The random uuid for the addon installation that determines the moz-extension://[this bit here]/dashboard.html URL. I was hoping there was some about:[debugstuff] page that could be loaded to list out the uuids of the installed web-extensions as an alternate way to find out the uBO dashboard URL. @fastcat You have other extensions installed? I thought that too then forgot to ask/mention. Yes, the auto-installed H264 codec, and PDF Viewer. I just tried disabling them and running the workaround ... didn't help. I tried uninstalling PDF Viewer and disabling the H264 codec (you can't uninstall it), didn't help. I also tried, in a separate Android user profile that has never had Firefox installed, installing it, installing the add-on, closing all the tabs, force-closing Firefox, launching, tapping the menu item, still no love. You mention it's a fresh install. Do we wonder whether an add-on update might make any difference (i.e. revert to an earlier build then update and see whether the workround helps)? Perhaps as a test - see whether any build of uBO works? I found 1.13.8 was ok.
Well, you could always use Nightly, it just works: https://play.google.com/store/apps/details?id=org.mozilla.fennec_aurora. As far as nightly ... IIRC nightly has a different sync channel (i.e. doesn't share Firefox Sync data with the release channel) which would be a dealbreaker for me. I did install the Firefox Beta app in the isolated profile and uBO within that, and this problem is definitely gone there at least. So I guess within a couple weeks 56 should be released and this will be largely a moot topic, right? yeah... I got to 1.13.8 through AMO. There was a link on the uBO page (i.e. I just searched for uBO through FF's add-on search and browsed the uBO page). OK, the direct link worked to install ... will have to wait for it to auto-update and see if the workaround works then. After auto-update, workaround is still not working on either device. But having installed the old version I was able to configure things, and the config seems to have been retained on the upgrade, so personally I can tolerate it being as it is until the next FF release comes around and things work normally again. Is it possible to prevent 1.13.8 from upgrading? Go to about:config and change extensions.autoupdate.enabled to false This will affect all extensions.